Commute component supports transportation to suburban employment opportunities for any economic group. The JA/RC Program was repealed as part of the passage of the Moving Ahead for Progress for the 21st Century Act (MAP-21). Funding for transportation projects that support low-income individuals is available for competitive award beginning in 2015 under the Urbanized Area Formula Program. JA/RC projects funded from the 2007-2013 Calls for Projects may be ongoing in the region. The standalone program was repealed under MAP-21. Beginning in July 2012, JA/RC type projects became eligible under the Urbanized Area Formula Program. Applicants may include local government agencies, social service agencies, tribal governments, private and public transit operators, non-profit organizations, and regional transportation planning agencies. Job Access/Reverse Commute funds may be applied to the capital, planning, and operating expenses that support the development and maintenance of job access and/or reverse commute transportation services. 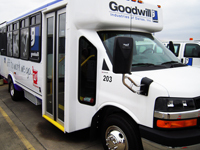 A Job Access project provides services that transport welfare recipients and low-income individuals – including economically disadvantaged persons with disabilities – to and from employment and employment related activities. A Reverse Commute project facilitates the provision of transportation services for the general public from urban, suburban, and rural areas to suburban employment. Operational planning for the acquisition of intelligent transportation technologies to help plan and operate coordinated systems inclusive of GIS mapping, Global Positioning System technology, coordinated vehicle scheduling, dispatching, and monitoring technologies as well as technologies to track costs and billing in a coordinated system and single smart customer payment systems. The local share must be provided from sources other than federal Department of Transportation (DOT) funds. Some examples of sources of local match which may be used for any or all of the local share required include, but are not limited to State or local appropriates; other non-DOT federal funds; dedicated tax revenues; private donations; revenue from human service contracts; and net income generated from advertising and concessions. Other federal, non-DOT funds may be used for local match when transportation is an allowable expense under the given program. Examples of types of programs that are potential sources of local match include, but are not limited to employment training; aging; community services; vocational rehabilitation services; and Temporary Assistance for Needy Families (TANF). To be eligible for local match for FTA funds, the other non-DOT federal funds must be used for activities included in the total net project costs of the FTA grant. Expenditures of other federal funds for transportation outside of the scope of the project cannot be applied as a credit for local match in the FTA grant. Local match may also be derived from other federal funds that are eligible to be expended for transportation, other than Department of Transportation (DOT) programs. Examples include, but are not limited to, Temporary Assistance for Needy Families (TANF), Medicaid, Employment Training, Rehabilitation Service, and Administration on Aging. Projects selected for funding under the Job Access/Reverse Commute Program must be derived from a locally developed, coordinated public transit-human services transportation plan. The regional coordination plan, Access North Texas, identifies region-wide and county-wide strategies to address transportation needs. Project submittals must be consistent with strategies identified through the Access North Texas Plan. The complete plan can be found at www.accessnorthtexas.org. Other federal requirements, such as those related to Civil Rights, Disadvantaged Business Enterprise (DBE), Buy America, School Transportation, Lobbying, and Drug and Alcohol Testing apply to JA/RC funded projects. This includes Labor protections required under Title 49 U.S.C. 5333(b).